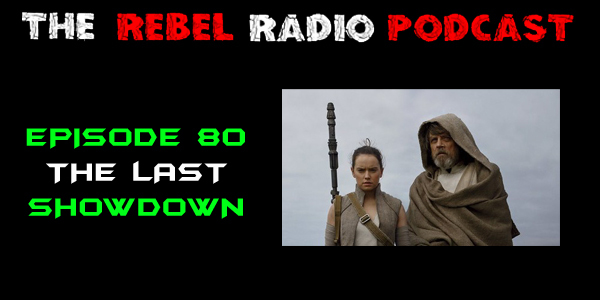 It's the final episode of The Rebel Radio Podcast and the gang's all here! Well ok so that's a bit of a lie as it is simply the final episode in this current format before the reboot! So we dive right in to the greatest showdowns in movie history! Superman vs. Zod! Rocky vs Creed! Gondor vs Mordor! What are the greatest showdowns in movie history? We tell you what we think some of them are but before we get to that we have to talk about a little movie called Star Wars: The Last Jedi! We go all in as we discuss Star Wars: The Last Jedi with plenty of spoilers and thoughts on the film. The argument even gets a little hrated as a couple of us agree to disagree! This may be the most decisive Sta Wars movie ever released but could also be one of the best ever released?! All this and more as we talk the latest film from a galaxy far, far, away! We then tell you a little bit about the upcoming reboot of the show and more in this final episode of 2017 that got released in 2018!